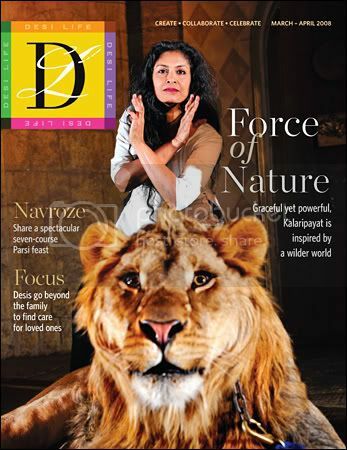 If you want to see something really idiotic, check out the video of a lion attack incident (below) during a photo shoot for the Toronto Star’s Desi Life cover. If you watch, closely there are multiple incidents and you can see the idiot animal trainer reinforcing the 397 pound lion with food after the first incident where the cat knocks over editor Sonia Verma. Geezuhs, the whole thing made me cringe. Male lions tend to be particularly possessive when it comes to food and using bait was a bad idea. You can see how the lion’s behavior keeps escalating until he grabs Gitanjali Kolanad, a martial arts instructor…and then keeps trying to get back at her. The other trainer was not there to help intervene in the first incident and just ambled over after–watch how he tosses the lion food right after (reinforcing the attack/unruly behavior with food). Trainer error occurs again when the lion goes after the photographer Richard Lautens. I read that off-camera, the lion also went after the legs of art director Spencer Wynn. Then the cat snarls at the camera–and watch his ears as “Leo” the lion shows more agitation while the martial artist does her kata in the background. The trainer at the end of the cat chain is busy talking and is not watching the cat–until the cat is lunging toward his victim. The other trainer kicks the lion off the woman and then is bent over the victim–instead of focusing on getting the lion out of the area first. Person down = easy target and is tempting fate. I once watched a colleague stand over a victim to protect him from repeated attacks. Most of us like to mitigate behavior before it escalates to this degree. All I can say is they were lucky it wasn’t worse. You can see the cat becoming more unruly in the background–rolling on the ground and attempting to get back to Gitanjali Kolanad. When the lion begins to again focus on the martial artist–the idiots don’t move the animal out of the area, toss more food to him, and struggle to keep the cat from attacking when they could have mitigated early on. The one trainer does manage to block another attack–but reinforces it again with food. This low level attack did some damage and could have been worse but the repeated training errors are inexcusable. In case you are wondering, the lion broke four of Gitanjali’s ribs, bruised her lung and put her out of commission for a while until she recovers. Right, if it were a serious attack attempt it would have been worse. The lion was being a teenager–same thing happened with the school teacher a few weeks back. Same sort of low level precursors and then minor injuries in comparison to something more intense. The problem is–it doesn’t matter if the lion “tackled” the person in play or with intent to harm–the trainers screwed up and allowed injury to occur. Actually, the guys probably were not trainers but zoo keepers as I recently read more about the incident which took place at the Bowmanville Zoo: http://www.bowmanvillezoo.com just because someone works with animals does not mean they are good at animal behavior or training. Captive animals tend to be heavier. Teens are full grown just need to bulk up a bit more and grow a longer mane. It is not unusual for African Lions to get up to 500 pounds. I worked at the zoo when that Lion was a cub. The only reason that woman wasn’t harmed more seriously is Leo is declawed in the front, along with his brother. She took a beating but yes, it was lucky for her that the cat was declawed. Most of the captive exotic cats I have worked with on set or in the general public are declawed in the front as a safety precaution.